Is It Good? Axe Cop Volume 5: Axe Cop Gets Married and Other Stories TPB Review – AiPT! It’s been a big year for nine-year-old “writer” Malachai Nicolle. Not only did Axe Cop get his own animated series on FOX (which has been renewed for a second season), but his 33-year-old artist brother, Ethan, got married, surely influencing the decision to let Axey tie the knot himself in Axe Cop Volume 5: Axe Cop Gets Married and Other Stories. Is it good? 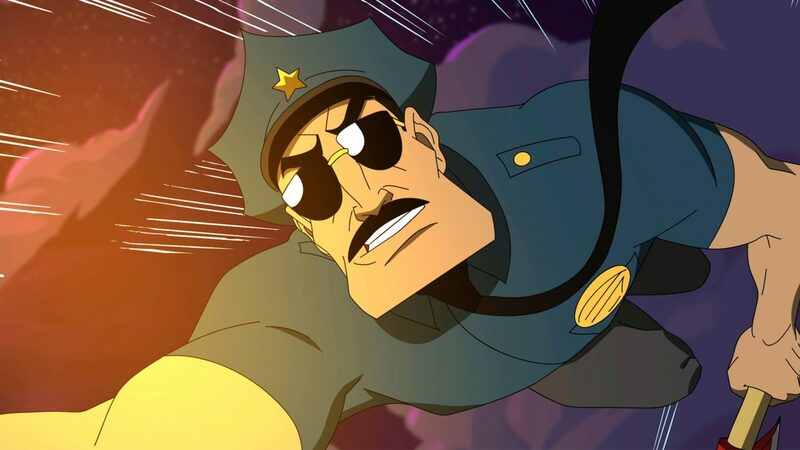 I visited axecop.com for the first time over two years ago, and I have yet to discover another comic—or any piece of media, for that matter—that inspires the same kind of joy in me that Axe Cop does. If you’ve never read Axe Cop, or if you’re only familiar with it through the show, you can find a much better introduction than I could provide here, but in a nutshell, Axe Cop is what happens when you harness all of the exuberance of one child’s imagination and filter it into a comic about an axe-wielding superhero. There’s a refreshingly ingenuous charm to the comic that the show will never be able to capture so long as its writers room remains dominated by adults. That’s not a dig on the television series — I moderately enjoyed the first season, and I love the cast, particularly Nick Offerman (who writes the forward to this volume) as the titular protagonist, but Axe Cop just isn’t Axe Cop without the brothers Nicolle. This volume starts with another batch of “Ask Axe Cop” entries, which may be my favorite feature of the webcomic. Each AAC here made me laugh out loud at least once, including the ones that do not even fill an entire page. Then we get the first long-form story of the volume, “The Dogs.” It’s the first Axe Cop storyline to be presented in color (not counting the print-exclusive Bad Guy Earth miniseries), and colorist Kailey Frizzell hits all the right notes. “The Dogs” is definitely one of the weaker Axe Cop storylines, as it drags on a little bit longer than it should, but it’s still funnier and more entertaining than most other comics can ever hope to be, while featuring some of the series’ most impressive art yet, thanks again to Frizzell. Then, after another round of Ask Axe Cop entries, we’re finally presented with “Axe Cop Gets Married,” which may not be the funniest Axe Cop storyline, but it’s easily the sweetest as we get a look at how a nine-year-old boy views the strange world of love, dating, and marriage. Unlike the Bad Guy Earth and President of the World trades, the vast majority of content found in Axe Cop Volume 5 (as with volumes 1 and 3) can already be found for free online, save for some preliminary sketches and fascinating commentary by Ethan. As with most print publications of webcomics, some readers may not see the point of spending the extra money, but if you prefer print as I do and want something that you can keep on a bookshelf, this volume is obviously the way to go. Just be sure to support the Nicolle family by making a small donation or buying some merch if you do decide to stick with the online option, though. No matter how you prefer to read Axe Cop, just do yourself a favor and give it a try. Granted, it’s not for everyone, as the unapologetically childish nature of the comic may prove too silly for some readers. But it definitely appeals to a certain kind of person that had a certain kind of childhood. I think Malachai is a lot like I was when I was a little kid. Long before I decided to become a writer—heck, before I even knew how to read—I was enchanted by superheroes, crime-fighters, or any other media that involved good guys inflicting terrible violence upon bad guys. I used to create dramatic yet highly improbable storylines for my action figures as the Black Ranger teamed up with Spider-Man to defeat Barney the Dinosaur. Axe Cop brings me back to the days when I could get away with telling the craziest, stupidest, and most unabashedly fun stories that I could without pretension. At nine years old, Malachai’s progression as a “writer” has been interesting to watch since he co-created Axe Co at the age of five, but one fears that time may be running out before he’s too old and cynical to maintain the hyperactive innocence that Axe Cop requires. I could only hope that he doesn’t stop imagining or storytelling, because this kid could very well turn into the next Neil Gaiman if he sets his mind to it. Oh yeah. If you were ever accused of having an “overactive imagination” as a child, Axe Cop may be a revelation.